I often wake up with a song going through my head. I don't know why this happens. The stranger thing the songs. Yesterday was good, I woke up to Led Zepplin's Immigrant Song — what a great way to start the day. But earlier in the week it was inexplicably the Golden Girls Theme Song. Gah! I've heard them called earworms: songs that get stuck in your head and don't get out. So I'll share with you now the antidote, taught to me by my good friend Jane Manning. Thanks, Jane! 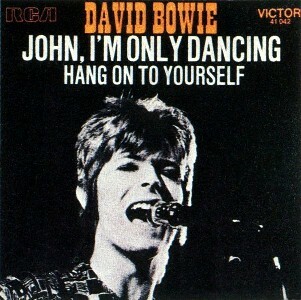 Sing David Bowie's song John, I'm Only Dancing. Not one of Bowie's better known songs, nor even one of his best, but remarkably well suited to this. I believe it's because the melody is kind of odd and not all that pleasant, so it's not going to get stuck itself. You kind of remember the melody and lyrics, but not quite, so that keeps you busy. It always does the trick.